The basis for the HBO® Original Series starring Jason Schwartzman (Rushmore), Zach Galifianakis (The Hangover), and Ted Danson, Bored to Death is a Raymond Chandleresque tale of a struggling Brooklyn writer—curiously named Jonathan Ames—who, in a moment of odd whimsy and boredom, becomes a private detective after spontaneously posting an ad on craigslist. As a rank amateur who just thinks he can help, this Ames alter ego quickly becomes embroiled in the search for a missing NYU coed. He moves from one scrape to the next, all while trying to escape a life of periodic alcoholism, dead-end relationships, writer’s block, and hours of Internet backgammon. 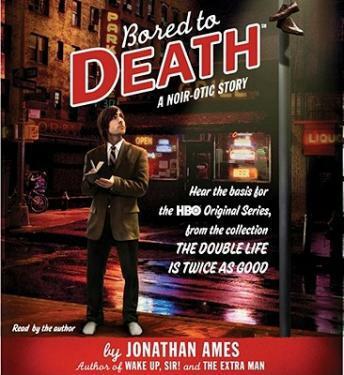 Bored to Death was originally published in McSweeney’s Issue 24 and is the centerpiece of Ames’s collection of essays and fiction, The Double Life Is Twice as Good. Bored to Death Artwork © 2009 Home Box Office, Inc. All rights reserved. HBO® and related channels and service marks are the property of Home Box Office, Inc.